Laughter at what God has done, though it seemed impossible. Laughter at the notion of God doing something amazing through us. 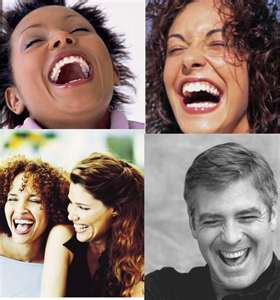 Laughter – the best medicine, they say. I hope something or someone really makes you laugh today. It’ll do you the world of good ! Don’t you just get the sense of God’s protection over Hagar and Ishmael – he sees their plight, the cruely of their lot, and promises to make a great nation out of Ishmael also. BEERSHEBA – love the intricate detail about Abraham’s treaty over the well he’d made, and the purchase of land for Sarah’s burial. Definitely someone trying to ensure the legal facts about ownership are on record ! ‘Land’ is important, isn’t it. So much misery caused over disputes about land. I do keep in mind praying for the dispossessed, the land-less, the refugee. 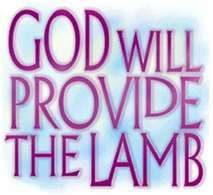 GOD WILL PROVIDE THE LAMB – However horrific it sounds to us, the story of Abraham’s willingness to sacrifice Isaac is a test of Abraham’s trust in God (both his entrusting everything to God, and his faith in God’s covenant promise to make, through his offspring, a nation as numerous as the stars and sand-grains). There are such beautifully touching moments in this story too – all too easy to see paralleled in the image of Jesus as God’s only Son, the Lamb, offered as the sacrifice once for all. 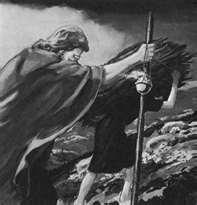 I was touched by Isaac carrying on his back the wood for the sacrifice, and it brought images to mind of Jesus carrying his own cross of wood…. We have Jesus calming the storm on Galilee (so many memories flooding back of a wonderful afternoon in a boat on Galilee….nothing quite like it (looking forward to being back there in November)), Jesus sleeps through the storm is woken and commands the storm to be stilled. “It became completely calm”. He is teaching the disciples, and you and me, not to fear, but to trust the one whom, “even the wind and waves obey”. He makes the link between faith and fear. We have Jesus healing two demon-possessed men (note that the demons recognise Jesus as “Son of God”). With one word – “GO”, the demons are cast out, and a whole town is stirred to encourage Jesus to leave, such is the powerful act they’ve just witnessed (and the power of the one word of Jesus). But Jesus has also brought peace to that town, where people had been fearful of the possessed men. “I desire mercy, not sacrifice” – “I have come to call sinners…not the righteous”. digging pits to trap others heightens the probability that you will fall into a pit yourself). is more interested in seeing ‘mercy’ in us, than ‘sacrifice’. Ultimately, that God will provide (and has already done so)….all that He asks or requires of us.